Well, there’s just over two weeks until Halloween – are you ready? I’m not. In years past I’ve made costumes for all four boys, starting in September and sewing away all through October. This year I’m only making one costume (the other kids are borrowing or recycling costumes) and I haven’t even started yet! 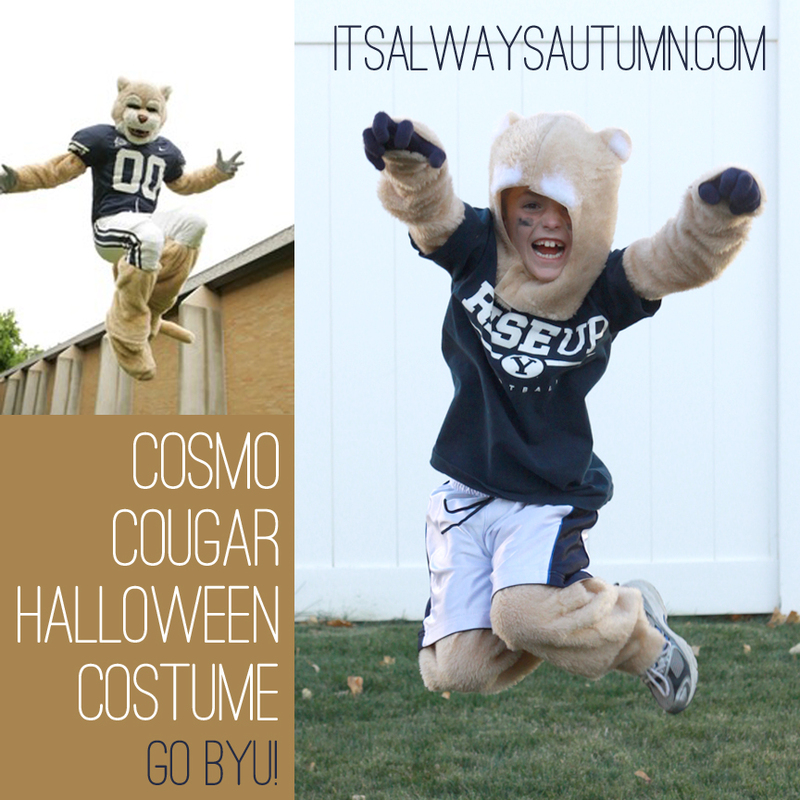 So as I avoid starting on this year’s costume, here’s a little run-down of my favorite costume from last year: BYU’s mascot, Cosmo Cougar. My son was pretty sure he was the star of his elementary school in this costume, and he certainly got a lot of compliments. The best part was that it was fairly simple to put together. Read on for a quick how-to. I bought some faux-fur fabric at Joann’s and got started. 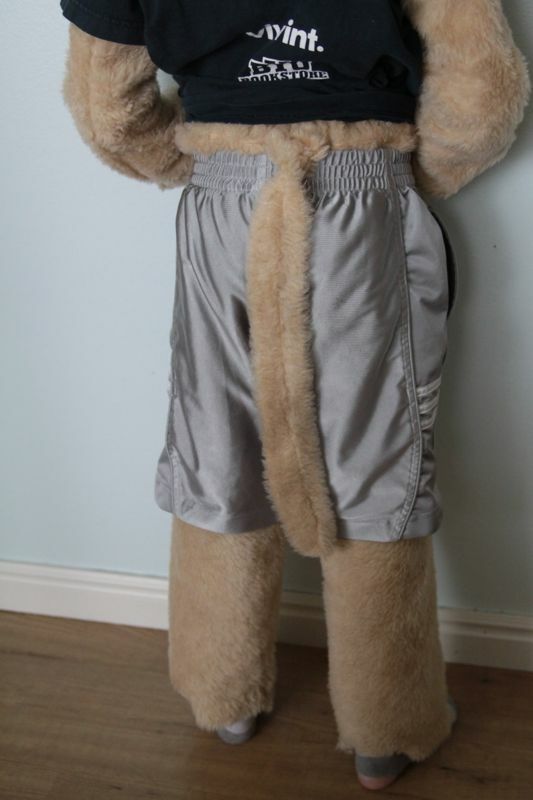 Since the backside of the fur wasn’t the most comfortable thing in the whole world I decided not to make a full suit of it – since Cosmo wears a shirt and pants anyway I just needed to cover the bottoms of his arms and legs. For each arm I sewed up a long tube of fabric that went from just under his armpit down past his wrist. Then I sewed a ring of elastic at the upper arm and another at the wrist to keep the “sleeves” in place. 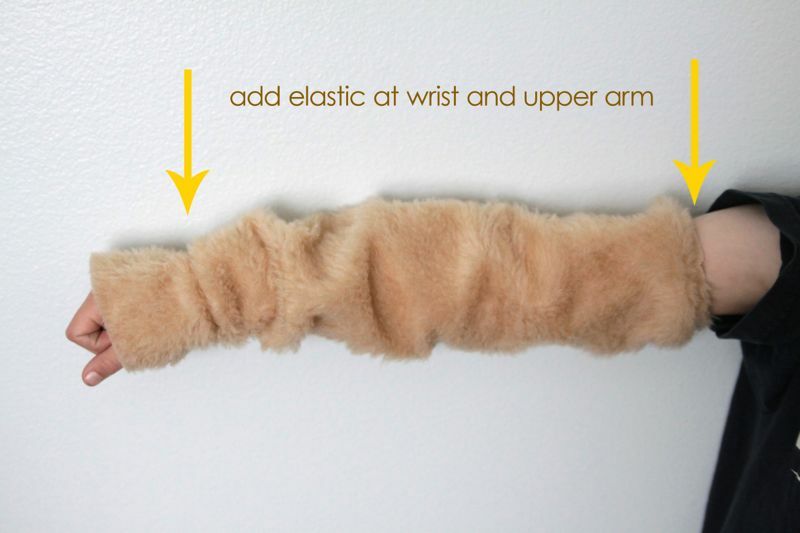 (I added the elastic the same way I did ruching in this post.) For his legs, I actually did full pants. I just traced a pair of pajama pants, sewed them up, and added an elastic waistband. I also sewed a long skinny tail into the waistband that hangs out over his shorts. I used a commercial pattern for the hood (any sort of animal costume hood would work as a basis), but in case you don’t want to go buy a pattern I’ve shown you the general shape of the pieces below. 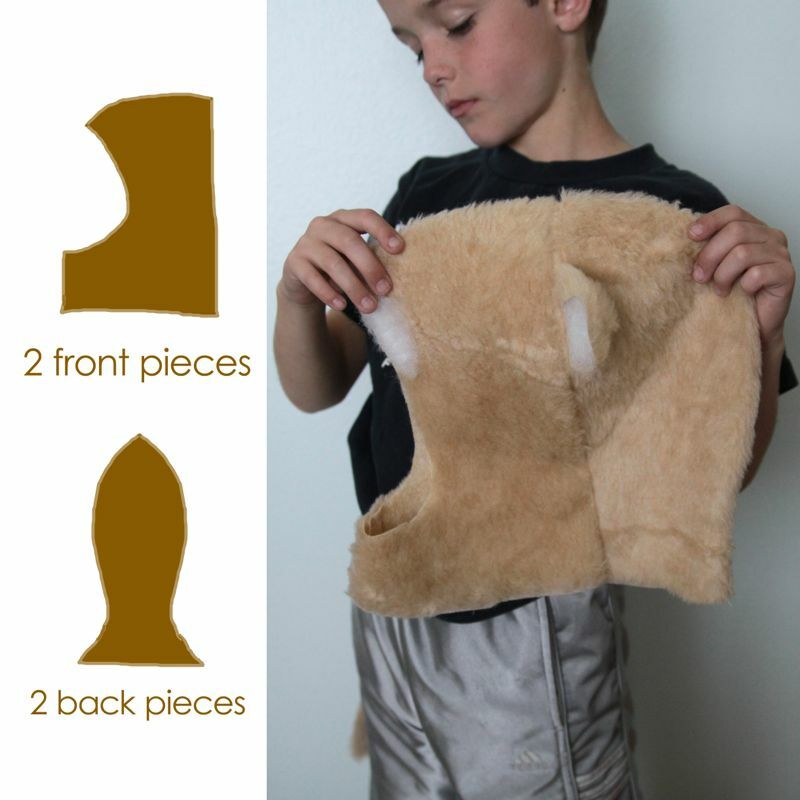 You could also just trace a hood from a sweatshirt to get the general shape. I sewed on a little polyester stuffing in the ears and over the eyes to make him look more like Cosmo. Add dark gloves and some football face paint, as well as a BYU t-shirt and basketball shorts or football pants, and Cosmo’s ready to go! 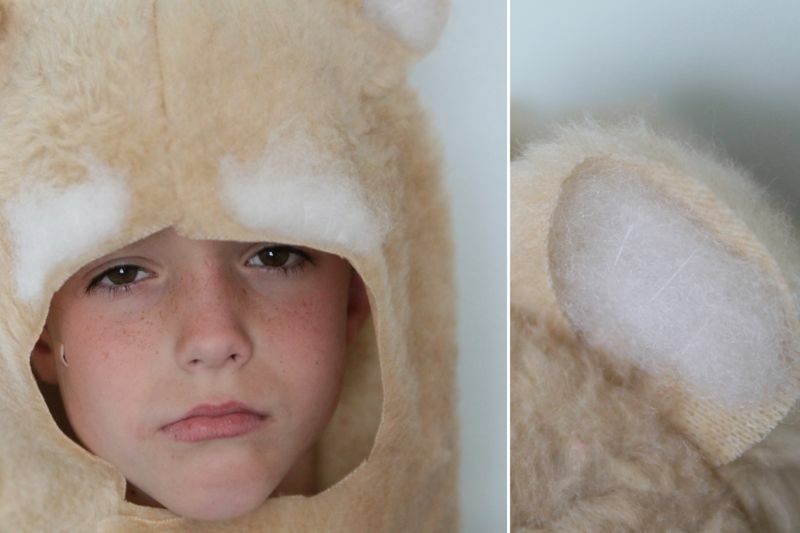 Super cute, easy and most important – its a warm costume! We never know what the weather will be like on halloween up here in Michigan! Great idea! My boys would love this! Can I rent this from you for my son? He’s got his heart set in being Cozmo and this is the only legitimate costume I’ve seen. 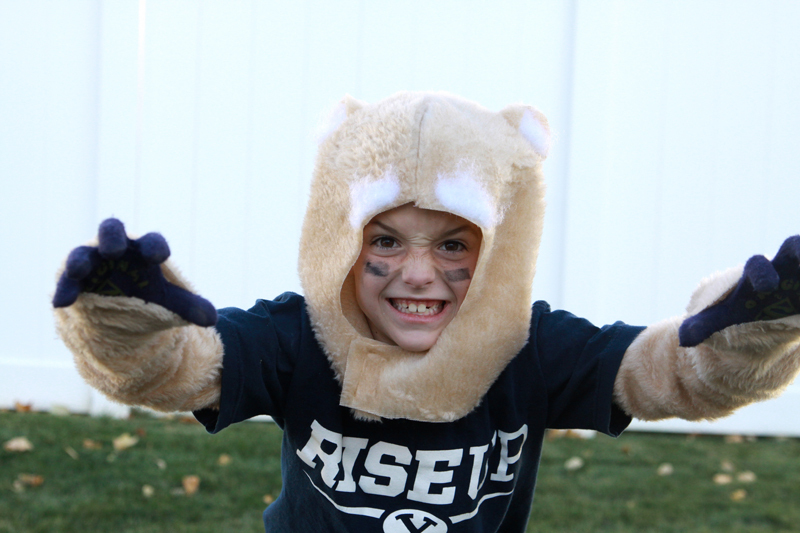 I love your cougar costume. 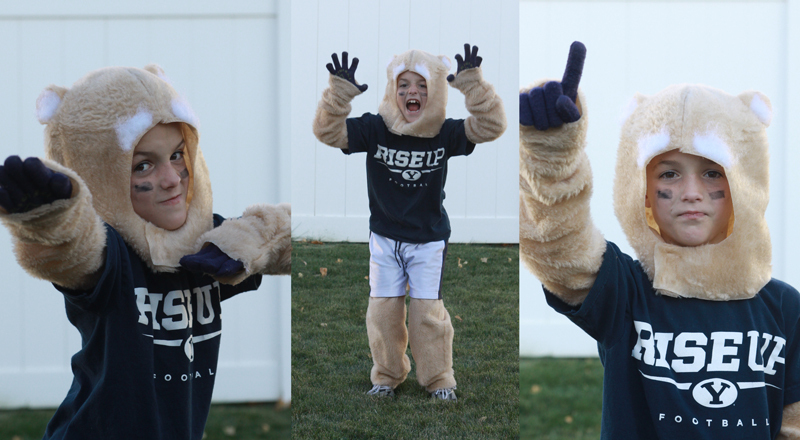 The mascot at our high school is a cougar and my son is longing for a cougar mascot costume of his own. Can I use your design or would you consider making a costume and selling it to me? Julie – I don’t make things to sell, but you are welcome to use my tutorial to make one of your one! Hi! We love your tutorial for Cosmo! I’m so glad you posted it because it’s the only one I have found. We are following your tutorial for my son for Halloween. I have a question–I am having a hard time figuring out how the two back pieces connect to the two front pieces? Is there any way I could see a picture of what the back of the head looks like?